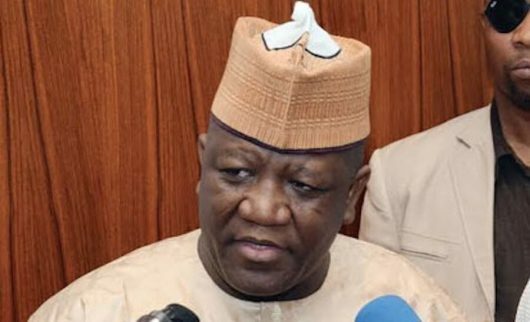 Zamfara State governor and Chairman of the Nigeria Governors’ Forum (NGF), Abdulazeez Yari, had ruled out the possibility of dialoguing with the bandits for ceasefire in his state. The governor stated this yesterday after a closed door meeting between President Muhammadu Buhari with the service chiefs. Asked about the possibility of adopting the option of dialogue to resolve the challenge of banditry, Yari said “I have told my people that that will no longer take place during my time. Because, I have done that three times, but it did not work. This is in the sense that we know their capacity. For instance, during the first dialogue, they invited some of our team: Army, DSS, Police and my Chief Security Officer as well as some traditional rulers’ representatives; and we have seen what they have. “They are in control of the kind of weapons that the Command in Zamfara State does not have. In one armory alone, they have over 500 AK47. We saw it. Our people were even given chance to take pictures. But when we said we will dialogue, offer amnesty, that they should surrender their arms, I can tell you till date we did not get up to 90 AK47. So, it is a deceit. That is why I said no more dialogue during my tenure. “During dry season they will look for dialogue, because they know the security can get access to anywhere in the forest and they have no place to hide. But when the rainy season comes and the forest becomes thicker, they will return to their normal practice. That is why I said there has to be a show of force before anything else. surrounded by forests from Sokoto we have Basuguma around; in Kaduna, Birnin Gwari, Niger, we have Kuyambana Dansado forest there; in Katsina, we have Rugu; and at South East of Zamfara where we have Maradi, we have forest there. “So, as the governor of Katsina said, we have to collaborate. I know our security chiefs meet quarterly to review their performance; the gain and the loss. The same thing goes for our brothers in Maradi. I think the operations need to be carried out simultaneously, because the issue is we are surrounded by a forest. “The point is, when Katsina puts pressure on the bandits, they will run into the forest in Zamfara. If Zamfara puts pressure on them, they move to Minna or Birnin Gwari. So, this is the issue; there is need for collaboration. Responding to whether equipments would be delivered to the troops in his state, the governor said “Yes indeed. The federal government has already given procurement contracts, inter-government transaction to the United States, China and other European countries. Meanwhile, none of the security chiefs agreed to speak to newsmen about the agenda of the meeting. Those in attendance were the Chief of Defence Staff, General Gabriel Olonisakin, Chief of Army Staff, Lt. Gen. Tukur Buratai; Chief of Naval Staff, Rear Admiral Ibok Ekwe Ibas and Chief of Air Staff, Air Marshall Abubakar Sadique. Others were the National Security Adviser, Babagana Monguno; Minister of Defence, Mansur Dan- Ali, Minister of Interior, General Abdulrahaman Dambazau ,Director-General of the National Intelligence Agency (NIA), Ahmed Abubakar, acting Inspector General of Police, Mohammed Adamu; the Director General of Department for State Service (DSS), Yusuf Magaji Bichi and the Inspector-General of Police, Mohammed Adamu. Also present were the Secretary to the Government of the Federation, Boss Mustapha, Minister of Interior, Lt. Gen. Abdulrahman Dambazzau and the Minister of Defence, Brigadier Gen. Mansur Dan-Ali were also part of the meeting.